Yes, this is a garden spider Araneus diadematus. These become adult in late summer and early autumn, and then their presence on their large orb webs is often more obvious in gardens. It is also a very variable spider in terms of colour and depth of markings. They are harmless to humans. A pair of spiders spotted in Southbourne, Dorset (BH52AW) having spun impressive webs (containing a catch of small flies) between a telephone cable, a rose bush and 1st storey brickwork! 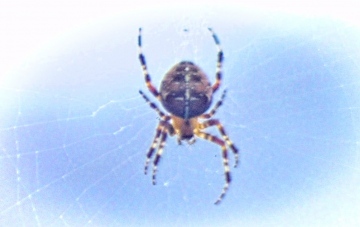 - appear to be a variety of Orb Weaver? 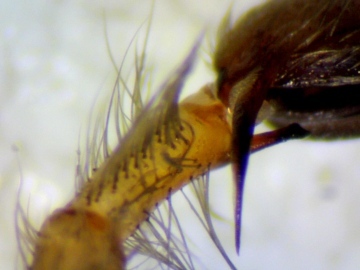 Male palps are often too complex and vary in appearance widely depending on precise angle of view, whether the palp is at all expanded or not etc. Where exactly in the habitat did you find the spider and have you got a photo of the whole spider? For definite confirmation one way or another you will need to send it to me at 32 Lodge Lane, Grays, Essex RM16 2YP. A. Roberts drawing of erraticum shows a distinct ventral projection at the tip of the tarsus, which this specimen doesn't appear to show. B. The drawing for virescens shows a tear-dropped shape at the end of the bulb, which this specimen shows and which appears to be absent from the drawing of erraticum. C. Roberts drawings show a smooth curve for the proximal spur projection of erraticum but a less smooth curve for virescens, as per this specimen. D. There is a slight fork at the apex of the projection at D, better fitting virescens. E. Although the hairs at E are rather tangled and stuck together they appear robust, again better fitting virescens. 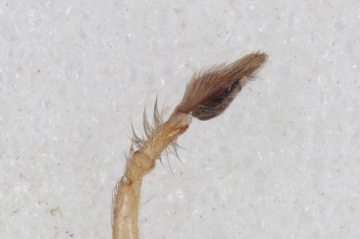 F. The longest hairs at F appear longer than the width of the patella, favouring virescens? Why is this not Cheiracanthium erraticum? I caught this male spider at Strathan, near Lochinver, Sutherland NC083205 on 12/06/2017. Using Roberts it appears to key to Cheiracanthium virescens, but I see that the nearest records on the SRS website are quite a way south of this location (heather moorland). Can you see enough from the palps to confirm the identity? Thanks. Thanks very much for the help Peter. I will take another look there when i get a moment and see if i can find one. Yes, this is Meta, either Meta menardi or M. bourneti. 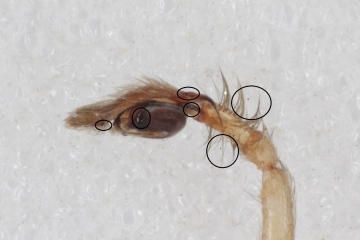 The difference is in details of the adult male palp or the adult female epigyne, and these will be almost impossible to see with any certainly with a lens. Palps are 3-dimensional and the structural differences are unlikely to be clear with a lens, the epigynes are obscured by hairs and subadult menardi especially would be very similar to bourneti. This is true even under a microscope if the lack of a fully adult epigyne is not appreciated. 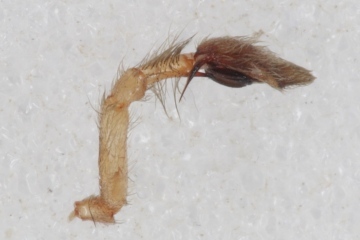 If you revisit the site and can collect an adult spider and send to me (alive) in a small plastic container with a little dampened tissue inside (cave spiders need humid conditions) inside a padded envelope I can determine which species. Peter Harvey, 32 Lodge Lane, Grays, Essex RM16 2YP (National Organiser, Spider Recording Scheme). So i wondered if anyone here would mind giving their thoughts on this beautiful spider please? Also, if this is indeed Meta, (and in case i see this spider again), how are the 2 similar species separated in the field? I normally carry a hand lens. I can supply a 10 fig grid ref for this observation if requested. All the other details that i have or know of the sighting are included in the above post (should you want take this as a record). I see there aren't many records for either species but can easily revisit this site for another look/better photos sometime, as it's not far from me. Your record has already been added to the recording scheme database, many thanks for the details. Excellent! Thanks Peter. So, if this is juvenile we may have a group as there was another in the kitchen today - unless they have a homing instinct of more than a few yards and under the door! Will someone be able to mark this as a new location record? I know the point n shoot are not good with such a tiny subject but it looked spot on to the eye and behaviour is so good - you see them zigzagging about, if you put a finger close they jump round to face you with typical spider eyes but standing up ant-style, then they give the game away by silk abseiling as you shift them out on a scrap of paper! Re: Synageles venator NEW RECORD? This certainly appears to be a juvenile Synageles venator (there are several other very similar European species not currently known in Britain). In Essex Synageles venator appears to have been turning up much more widely near the Thames in recent years and in a variety of habitats far from typical or with any obvious relationship to its expected habitat. The reasons for this are probably either climatic or genetic, and worth study.